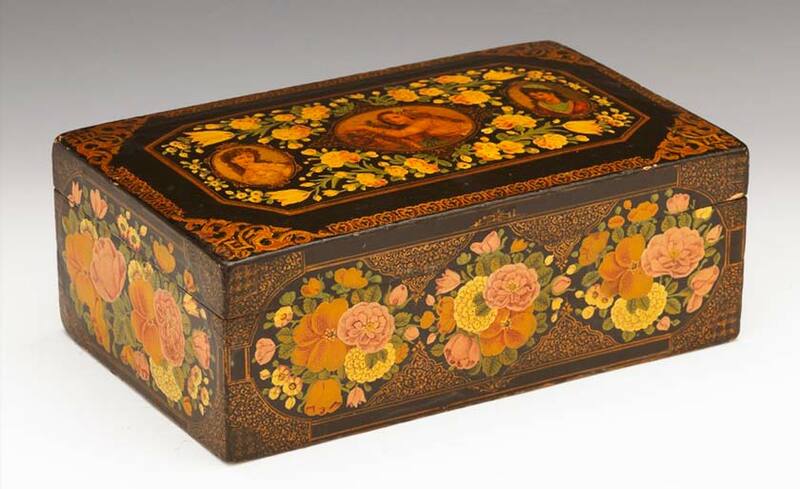 Papier mache is the art of making box, pen-case, frame, mirror and other decorative objects with delicate and colorful designs which are made of compressed cardboard. In this technique, paper plies and glue are shaped as soft paste with the capability of forming which becomes firm after drying. Papier mache was initiated from Asian countries and used in embossed designs and small religious statues in Europe since 15th century. In the 17th century, this method was used in doll making. 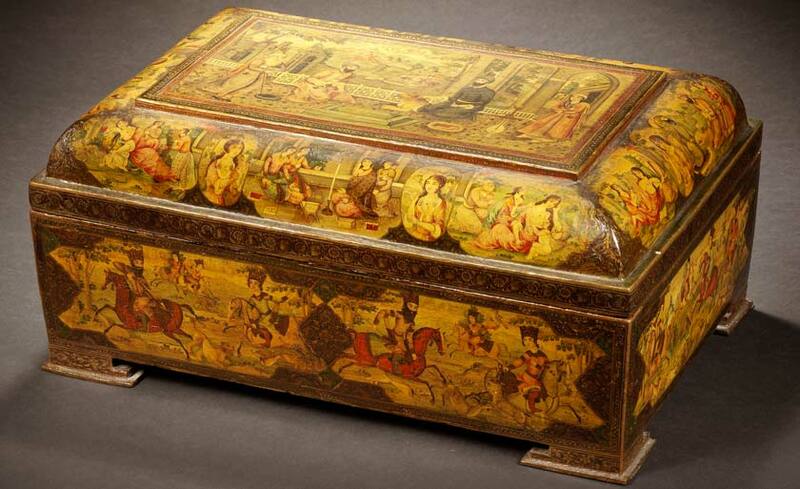 Papier mache is a French word which was a replacement of the word oil painting or lacquer painting in Safavid Period concurrent with making cardboard pen-cases. This style of painting on the cardboard body has been prevalent with more or less differences in some of traditional arts of China, India, Iran, and other places. In Iran, in the late 19th century (AH) papier mache was used particularly in the arts like pen-case painting in Ghazvin and Isfahan. In this artistic style, firm bodies with the capability of painting in watercolor are made of pulp and paper plies smeared with glue and wooden frames; in a way that first tiny pieces of cardboard or newspaper are soaked in water for a few hours and after draining its extra water by a filter, they are mixed with glue and pressed to be changed into a uniform grayish brown paste. The wooden mould which is covered with oily paper and lubricated, step by step, is coated with prepared paste depending on the shape that is to be produced. In the past, soap was used to facilitate the molding process. Having finished each stage, they wait until the laid layer loses its wetness and becomes a little dry then paste layer is added to it again so that it may reach the desired thickness. Having finished these stages, the layers are beaten and polished with a piece of bone or flat stick and the surface of work is coated with a layer of the tragacanth glaze. This is called surface-making. Colors used in papier mache are usually water-soluble dyes which are used by brush painting and through gilt work and miniature techniques. At the end the surface of the painting is covered for two or three times with a thick layer of Kaman oil that is a mixture of linseed oil and varnish. This is necessary for keeping the body of the work firm and the color stability on it; because of the mentioned lacquer, this art was called under-lacquer painting in the past. 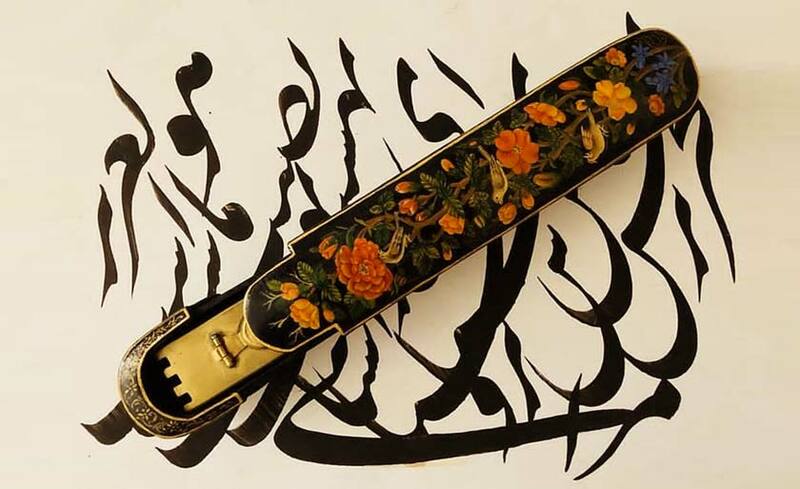 Most of objects which are made by this method include cover of valuable books like Koran, mirror frames, different kinds of makeup boxes, jewelry boxes with the shapes of square-hexagon-circle-ellipse and above all, small and big pen-cases. 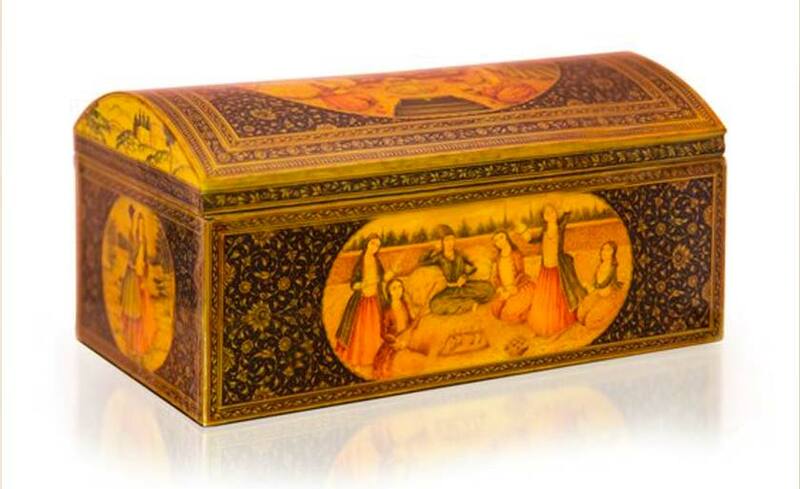 In fact, pen-case making is one of the most important products of papier mache technique because the most precious painting, miniature and gilt work heritages of the past have been performed on pen-case boxes.